More than a quarter of Canadians are already facing serious financial hardship, according to the findings of a new study released today as part of an examination of poverty. According to the report from the Angus Reid Institute, 21 per cent of respondents said they can't afford to go for dental care, while one quarter reported they have recently had to borrow money to buy groceries. Respondents were asked about 12 money-related situations, including whether they've used a pay day loan-type service, if they've used a food bank, if they've not been able to pay a utility bill and if they can afford to go for dental care. Those in the "struggling" group — roughly 16 per cent of the population — have faced at least four of the 12 situations, and roughly 77 per cent of them are experiencing at least one on an ongoing basis. Just above that group are those categorized as being "on the edge" who account for about 11 per cent of the population. They are more likely to have only recently begun to face financial challenges, but they're on the verge of serious difficulty, Angus Reid said. The rest of the population is roughly evenly spread over two groups: the "recently comfortable" and the "always comfortable." People in the former group generally know what it is like for money to be tight, but they aren't facing that situation right now. The vast majority of people in the latter group have never experienced any of the financial hardships situations described in the survey. In its report, Angus Reid pointed out that household income is highly correlated with the four segments, but maybe not as highly as might be expected. The research group pointed out that more than one in five people in the "struggling" group, have household incomes between $50,000 and $100,000. However, based on their survey responses, those people are facing financial difficulty, which might be due to debt, the cost of living in their area or the expense of child-rearing. Asked if they view their personal financial situation as better, worse or the same as their parents at the same stage of life, 67 per cent of those "struggling" replied they were worse off, while 54 per cent of those "on the edge" thought they were doing worse than their parents. 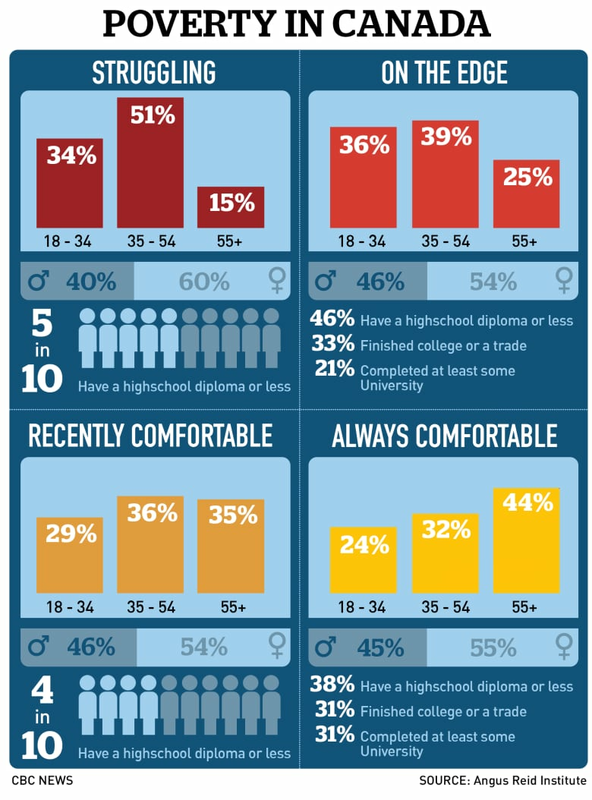 Among the "always comfortable" group, only 16 per cent thought they were worse off. 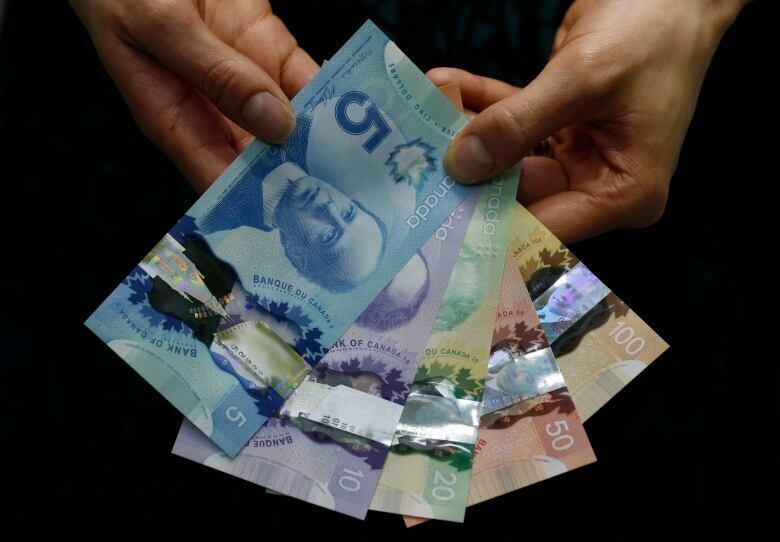 Angus Reid said the finding — that those experiencing poverty are the most likely to say they are losing ground from the previous generation — suggests "that the self-perpetuating nature of economic class is alive and well in Canada." However, the situation is much different when it comes to people's outlook for the next generation. When asked how they view the prospects of their children, Canadians were "almost uniformly pessimistic," Angus Reid reported. ​Angus Reid conducted the survey online between May 28 and June 13, polling a randomized sample of 2,542 Canadian adults who are members of Maru Voice Canada, an online market research panel. The sample plan included a special booster sample of 242 respondents with household incomes below $35,000.